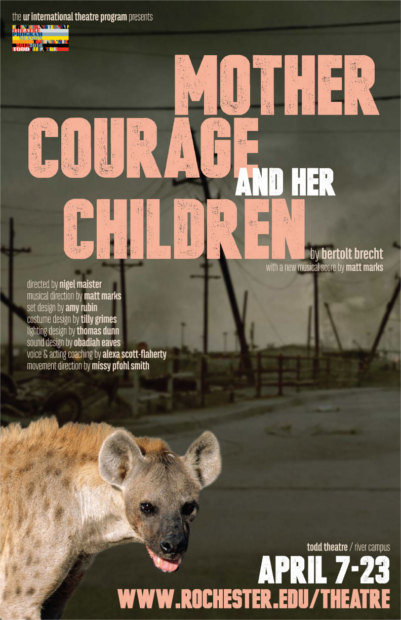 The UR International Theatre Program commissions is first original theatrical score: a pop-rock version of Bertolt Brecht’s timely and powerful work, Mother Courage and her Children, about the brutality and sacrifice of war -- directed by Nigel Maister, with a new musical score by acclaimed up-and-coming composer, Matt Marks. Brecht’s original play is considered the greatest anti-war play ever written and one of the towering achievements of 20th Century drama. Marks’s contemporary music, which mixes genres from rock to pop, imbues this superb drama about greed, hunger and the rapacity of conflict with a driving immediacy and explosive contemporary energy. Musical Score World Premiere.